Parnell railway station construction was completed in two stages. Image courtesy of Auckland Transport. The station began operations with limited services in March 2017. Image courtesy of Auckland Transport. Preliminary earth works on the station began in April 2015. Image courtesy of Auckland Transport. 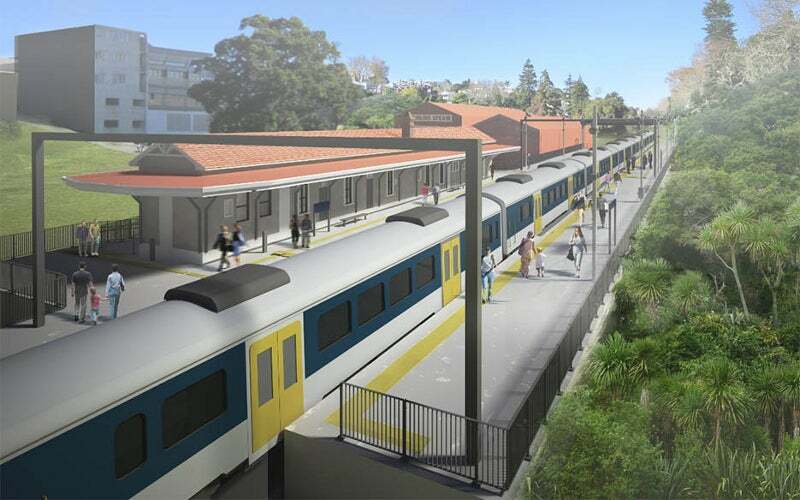 The station is being developed by Auckland Transport in association with Kiwi Rail to serve the Western, Onehunga and Southern lines of the Auckland rail network. The new station was opened to public with limited services in March 2017. It is expected to become one of the busiest stations in Auckland, with 2,000 passengers predicted to disembark trains in the 7:00am to 9:00am peak travel hours. Auckland Transport began planning the construction of the Parnell station in November 2011. The Auckland Transport Board approved $1.5m in funding to begin the detailed design phase of the new station in September 2013. Final approval for the construction came from the Auckland Transport Board in February 2015. The design proposed that the northern station would be constructed on the elevated land between Carlaw Park and Parnell Rise before the Strand overbridge, while the southern station would be built alongside the Mainline Steam workshops. The new station building and infrastructure was constructed in two stages. The first stage built two platforms with lighting, CCTV and ticket machines, and refurbished the Newmarket Station building, adding a new walkway to connect the existing underpass with the platforms. It also improved public transport connections to the university, museum, neighbourhood businesses and residences, as well as landscaping and planting. The second phase enhanced the links between platforms, constructed shelter canopies, and provided connections to the surrounding communities, including Carlaw Park, the domain and the museum. Stage one construction began with earthworks at the site in April 2015. The station platforms were completed by November 2015, with the main station works being completed at night. Flowable fill was used for the construction of the west-side domain platform. Construction work on rear wall foundations began in the second week of June 2015. The platform deck was also installed by June 2015. Installation of lighting, electronic gates, CCTV and other minor works are expected to be completed in late-2017. The new station will contribute to the regeneration and future growth of Parnell, and will serve students and faculty of the University of Auckland through existing and future pedestrian connections. It will also provide rail access for local business areas around lower Parnell, Stanley St and Beach Road. The project was completed with a total investment of $25.4m, which includes $13.9m for the station construction, $1.5m for the detailed design, and $10m for the stage-one track enabling works. TDG was contracted to provide a pedestrian capacity assessment aimed at determining the level of service of new Parnell station elements, such as stairs, bridges and platform areas. The company also reviewed local pedestrian paths near the new station to identify any pinch points and issues that may arise when large crowds use the station.